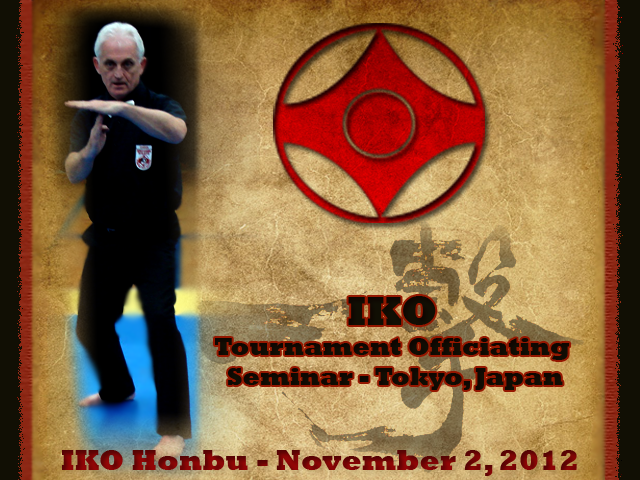 Prior to the 44th All Japan Open Karate Tournament, an IKO Officiating Seminar was held at IKO headquarters in Tokyo for all foreign IKO members attending the tournament. The clinic was conducted by IKO Tournament Committee Member - Stuart Corrigal. Members from: Russia, Ukraine, Australia, USA, Singapore, New Zealand, Poland and Lebanon attended the seminar to practice the various skills required for certification as an IKO Judge or Referee. At the end of the clinic, a written exam was held. New appointees will be listed soon on the IKO web site. This entry was posted	on Thursday, November 8th, 2012 at 12:07 pm	and is filed under Uncategorized. You can follow any responses to this entry through the RSS 2.0 feed. Both comments and pings are currently closed.